As a truck driver or fleet owner, your truck is your calling card. It is the first thing your customers see, and it serves as a moving billboard for your brand as it rolls down the highway. What does your truck say about you? A clean semi speaks volumes about your attention to detail and shows how much you care about your career as a truck driver. Want to drive for a trucking company in Iowa that provides you with the resources you need to keep your big rig looking top notch? Check out Simon’s Trucking detailing services. Here at Simon’s Trucking, we offer comprehensive detailing for our truck drivers. Our trained team is ready to assist you with a complete truck wash that covers everything from the grille to the chrome. When you drive for Simon’s Trucking, your tractor is washed every time you roll into Simon’s Trucking yard if needed. Our Iowa truck wash staff is onsite days, nights, and weekends to accommodate the needs of our busy truck drivers. This saves our drivers from having to pay out of pocket for truck washes. In addition, our drivers don’t have to waste time on over the road trucking routes searching for a local truck wash that could prove less than stellar. We focus on truck wash services as a benefit for our truck driving fleet. For starters, trucks that have been professionally detailed are less likely to be pulled over for inspection. In the instance that a driver is pulled over for a roadside DOT inspection, inspectors view clean trucks as an indicator that the driver is professional and up to snuff. For drivers, the time saved on fewer or shorter DOT inspections is well worth the time spent getting a truck washed. It also means our truck drivers are less stressed when it comes to dealing with inspections. When we provide professional detailing for trucks here at Simon’s Trucking, we respect our drivers’ privacy. We only clean the outside of the tractors. This is in line with our mission to treat each driver on our team with the utmost respect. Our truck wash services are here to save drivers’ time and energy. By taking care of our drivers, we help to create a positive and productive work environment for our team of truckers in Iowa. If you are searching for Iowa trucking jobs, let Simon’s Trucking be your first choice. We hire qualified truck drivers for over the road trucking and regional truck driving jobs. Contact our office today to request more information about driver pay and benefits. Ready to start driving now? Apply online now. 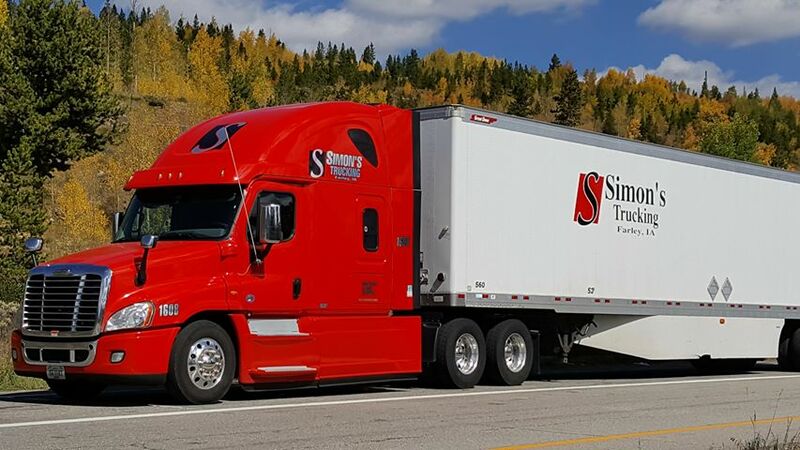 Simon’s Trucking is always looking for high-quality, experienced professional drivers to join their driving team.